If you are a visitor to Montana - one of America's most scenic and awe-inspiring states no doubt, plan a unique ghost-hunting adventure and stay at one of Montana's haunted hotels. And if you are a lucky resident of Montana, get to know your state's spookier side and embark on an exploration of the unexplainable and visit one of Montana's very own haunted hotels. 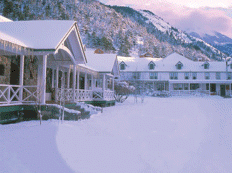 One of its most haunted hotel is Chico Hot Springs Lodge & Ranch, that is home to the Lady in White. The infamous Lady in White has been making appearances and spooking guests and staff for some time. However, a solid story from May of 1986 reports that two security guards at Chico Hot Springs Lodge came upon a ghostly form of a young woman near the piano in the third floor Lounge. The only part visible was the upper body of the ghost, no legs. They even reported that the ghost stared right at them for several minutes, enough time for one of the guards to grab a camera from a nearby table and take a picture. Only a tiny white spot on the film showed up where the ghost had stood. The same apparition had been seen by guests several times in the past, but this was the first time the Lady in White was photographed. In 1990, two other security guards followed the Lady in White from Lobby to the hallway leading to Room 349, where her presence has been reported by many employees and guests. An antique rocker in the room always ends up facing a window, no matter in which room it is placed. Other unexplainable things happening include an old family Bible that stays open on a wooden bench in the attic, oddly never collecting dust.